To provide experiential pathways to lifelong learning in science for children and adults through exhibits, programs, and films. 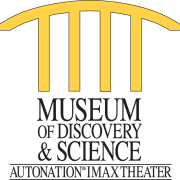 The museum is a private, non-profit, multi-sensory, "hands-on" museum of science whose goal is to stimulate and develop visitor curiosity and excitement. Great for teens and senior citizens! Would you recommend Museum of Discovery and Science?